The “Bolshoi Ballet HD Collection” released by the independent Paris-based video label BelAir Classiques, has thus far been exemplary in producing ballet for home video, offering superb quality in all respects. The latest title in the series, Marco Spada, is unfortunately something of a mixed blessing. For one thing this ballet – a contemporary rewrite by French choreographer Pierre Lacotte of a lost 19th-century creation – is a true rarity. Marco Spada, or The Bandit’s Daughter set to music from Daniel Auber is a sparkling and colorful evening-length dance divertissement, a jolly romp in a sumptuously traditional setting, danced by a tremendous cast that assembles some of the most exciting dancers gracing the Bolshoi company at the moment. Yet all these goodies come with a price, a technical issue. There is some judder noticeable in the Blu-ray resulting in a slight stutter in movements or panning. (The disc was tried on two different players and TVs with the exact same result, while the problem was also mentioned on internet forums as well.) Nothing that would make the disc unwatchable, but still something that should have been avoided. 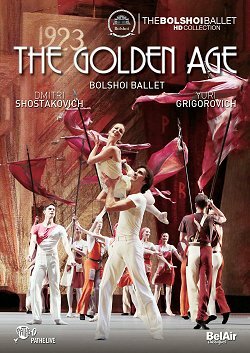 Categories: Blu-ray and DVD reviews | Tags: ballet, BelAir Classiques, blu-ray, Bolshoi Ballet, Bolshoi Ballet HD Collection, Bolshoi Theatre in Moscow, classical ballet, dance, David Hallberg, Evgenia Obraztsova, Marco Spada, Olga Smirnova, or The Bandit's Daughter, Pierre Lacotte, Semyon Chudin | Permalink.